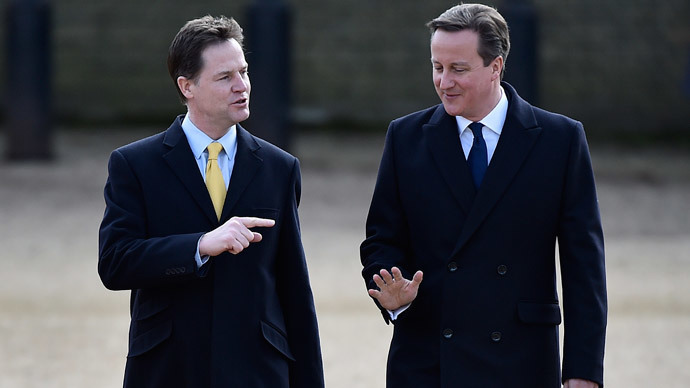 Prime Minister David Cameron and his deputy Nick Clegg announced a 3 percent rise in the minimum wage on Tuesday, the biggest real-term increase since 2008. Trade unions say the move will fail to tackle in-work poverty. Cameron and Clegg said the new minimum wage, to come into effect in October 2015, will be at a new rate of £6.70 per hour, an increase of 20p. A joint statement from the leaders said the change would benefit more than 1.4 million of Britain’s lowest paid workers. But the Trade Union Congress (TUC) warned it would not provide as much relief for the UK’s poorest. “With one in five workers getting less than a living wage, this is nowhere near enough to end in-work poverty. Britain’s minimum wage workers should be very fearful of the billions of pounds of cuts to government help for the low paid that the chancellor is planning if re-elected,” she added. Cameron and Clegg also announced the minimum wage for apprentices will increase by 57p per hour to £3.30, which they say would halve the gap between apprentices and the current minimum wage for 16 and 17 year olds – £3.87 per hour. O’Grady said while the apprentice wage rise is positive, there should be no gap between apprentices and working teens. Nick Clegg said the rise was to support workers getting on the first rung of the career ladder. The announcement comes only days after the Independent revealed that not one single high street retail chain was committed to paying its workers the living wage. The living wage is set at £9.15 an hour in London and £7.85 an hour in the rest of the UK. It represents the minimum pay rates needed in order to lead a decent standard of life. The TUC, the Green Party and the Trade Unionist and Socialist Coalition (TUSC) all support the introduction of a £10 per hour minimum wage.